New, close-up images of various regions on Ceres’ surface along with data the spacecraft obtained about the dwarf planet’s surface composition were presented by members of NASA’s Dawn team on Tuesday, March 22, at the 47th annual Lunar and Planetary Science Conference, held at The Woodlands, Texas. Dawn is now orbiting Ceres at just 240 miles (385 km) above the surface, closer than the International Space Station (ISS) is to Earth’s surface. The images reveal several craters in unprecedented detail while information collected by the spacecraft’s other science instruments indicate surface and subsurface composition vary across the small world. For example, Dawn’s visible and infrared mapping spectrometer (VIR), which observes the way the surface reflects different wavelengths of sunlight, enables scientists to identify specific minerals. Another instrument on the spacecraft, the Gamma Ray and Neutron Detector (GRaND), also helps in identifying surface minerals by measuring the neutrons and gamma rays produced when surface materials interact with cosmic rays. 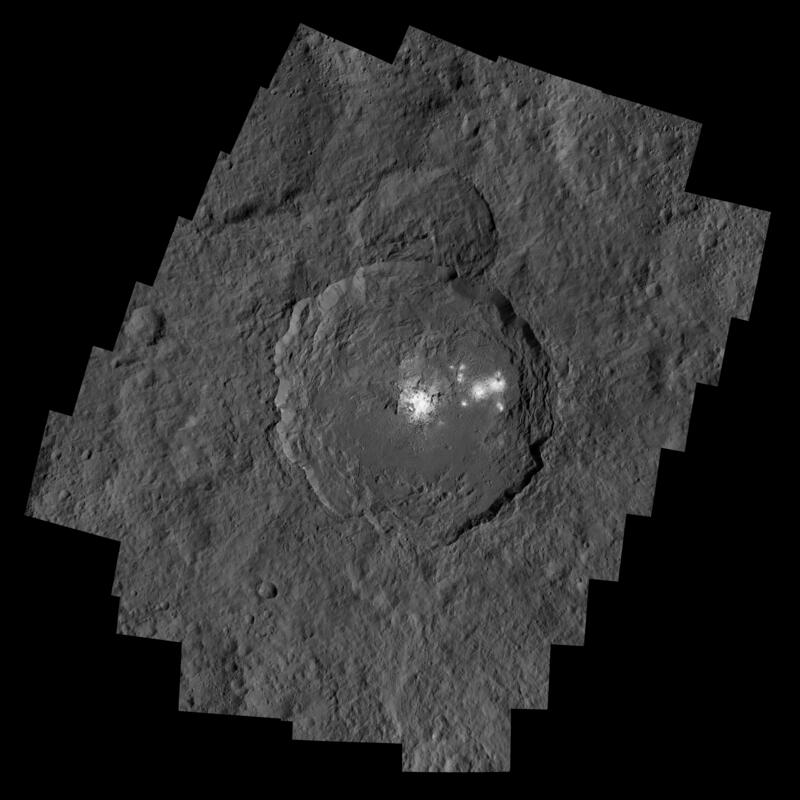 This data makes it possible for Dawn’s science team to determine the exact chemical makeup of Ceres’ surface. While Dawn has been orbiting Ceres for more than a year, these latest images present intriguing features that hold clues to the dwarf planet’s geological past. Occator Crater, site of the mysterious bright spots, is now estimated to be just 80 million years old, making it one of the youngest surfaces on the small planet. Initially, two bright spots were visible in the 57-mile (92-km) wide, 2.5-mile (4 km) deep crater, but as the spacecraft spiraled closer to the surface, it became clear that these actually were many bright spots. The newest images show the bright center of this crater to be a pit with smooth walls and a dome shape. The top and sides of the dome, as well as other bright regions in the crater, are covered with fractures and linear features. According to Dawn co-investigator and planetary scientist Ralf Jaumann of the German Aerospace Center (DLR) in Berlin, these features indicate that geologic activity occurred in Occator Crater in the recent past. “Before Dawn began its intense observations of Ceres last year, Occator Crater looked to be one large bright area. Now, with the latest close views, we can see complex features that provide new mysteries to investigate,” Jaumann said. Scientists will need to obtain a more detailed geologic mapping of the crater before being able to test possible explanations as to how it formed, he added. Haulani Crater, which has an irregular shape, has bright streaks on its surface. Using VIR, mission scientists determined that it has a different composition than the majority of Ceres’ surface. “False color images of Haulani show that material excavated by an impact is different than the general surface composition of Ceres,” noted VIR instrument lead scientist Maria Cristina de Sanctis of the National Institute of Astrophysics in Rome. “The diversity of materials implies either that there is a mixed layer underneath, or that the impact itself changed the properties of the materials,” de Sanctis said. Ceres’ surface is composed largely of a mix of materials that include carbonates and phyllosilicates, but the proportion of these materials varies across different regions. To date, the only place where water has been found on Ceres’ surface is another young region – the six-mile (nine-km) wide Oxo Crater, located in the northern hemisphere. The water could have been brought to the surface by an impactor, a landslide, or both, said Jean-Philippe Combe of the Bear Fight Institute in Winthrop, Washington. Scientists are still uncertain as to whether the water is present as ice or is bound up with other crater minerals. 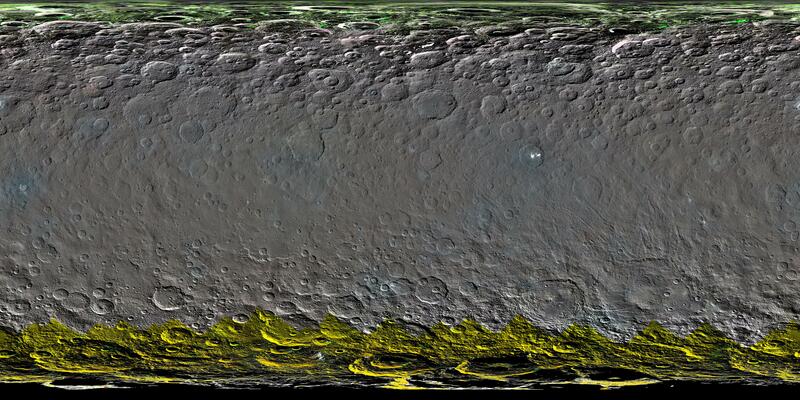 To emphasize how diverse Ceres’ surface is, the Dawn team published an enhanced color map (top image), in which blue indicates young features, including mountains, smooth plains, and flows. The various colors used in the map highlight areas where surface material was altered through a combination of an impactor and Ceres’ subsurface, which likely contains both volatiles and ice. GRaND, which only started collecting data in December, measured high concentrations of hydrogen in Ceres’ upper latitudes. This means these areas could contain water ice just beneath their surfaces. 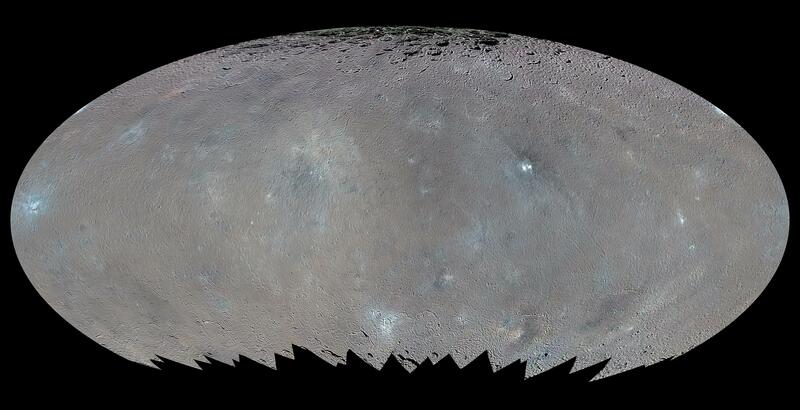 “Our analyses will test a longstanding prediction that water ice can survive just beneath Ceres’ cold, high-latitude surface for billions of years,” said Dawn co-investigator and GRaND leader Tom Prettyman of the Planetary Science Institute in Tucson, Arizona. Mission scientists are using the high-resolution images to tease out the processes that shaped the formation of Ceres’ surface and subsurface, as well as compare Ceres with Vesta in the hope of gaining a better understanding of the early Solar System.